Slots players must be an inherently destructive bunch. Whenever they get the chance, they’re playing games that involve blowing stuff up. What is it with us – are we all secret demolition junkies? Whatever the reason, the reality is that many great slots for action and bonuses have some kind of explosion theme, and slot developer Playtech’s fun Dynamite Digger video slot is no different. 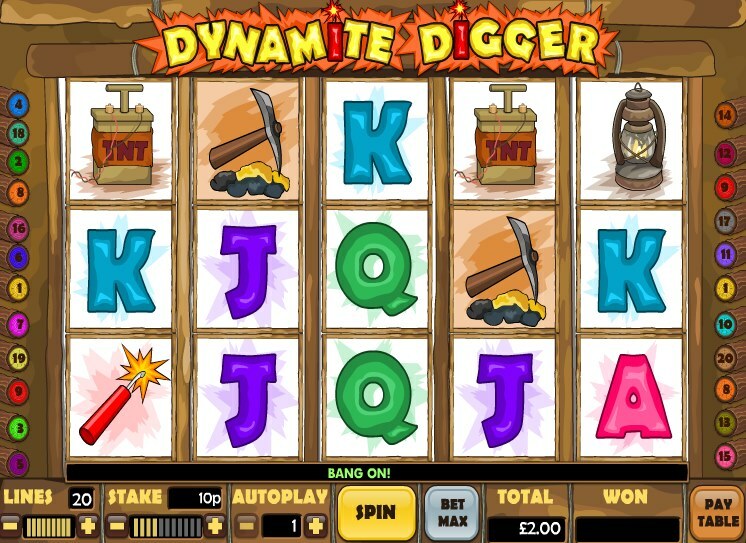 If you’ve played along with the underground miners of NetEnt’s Boom Bros or the prospecting heroes of treasure-themed slot, Gold Digger, from 3D giants, Betsoft Gaming, you’ll know there’s plenty of destructive fun around. So, how does Playtech’s offering stack up? Well, the developers behind the Marvel Superheroes cabal of games have gone for something a little simpler with Dynamite Digger in terms of graphics. The cartoony symbols are pretty simple, but if you tire of expensive cutaway sequences, you may be thankful for this. On the reels we get the bearded manic miner (the top paying symbol at 5,000x your line bet when hitting five across the reels), sticks of dynamite, a detonator, pickaxe, carts full of gold, plus the regular 10-through-Ace symbols. There are no Wilds, Scatters or Bonus rounds in this slot, so what you’ll hav... no, wait, come back! 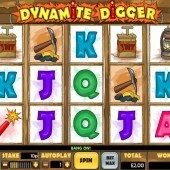 Good, I was about to say that the only real ‘bonus’ of Dynamite Digger is the Exploding Reels feature. Simply get a winning combo on the reels and the symbols will explode and disappear, allowing the icons above to fall into their place. If you’ve ever played slots with Cascading Reels, Avalanche Reels, or any kind of Bejeweled-style feature like this, you’ll be familiar with Exploding Reels. For slots fans wanting a quick fix, not wanting to bother with cumbersome bonus rounds, together with the bright and breezy graphics, you’ll probably warm to Playtech’s game. If a mere one bonus round without Wilds or Scatters makes you feel a little short-changed, however, you may want to look elsewhere.